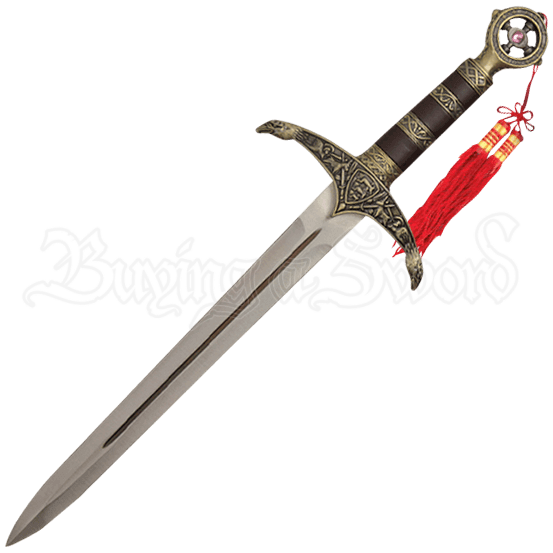 Modeled after the weapon of the legendary medieval outlaw, the Ornate Brass Robin Hood Tassel Dagger is a remarkably detailed decorative dagger with a stainless steel blade and brass fittings upon its hilt and included scabbard. A fuller extends down the spine of the dagger, adding detail to the medieval replica weapon. Gently curved upwards, the arms of the cross guard are brass eagle heads, a tapestry-like scene spread between them. Bands of brass Celtic knots and scrollwork alternate with brown composite along the daggers grip. A Crusader cross with a gemstone detail appears within the round brass pommel, and a regal red tassel hangs from its end. A beautiful display piece all on its own, this decorative Robin Hood dagger comes with an equally ornate scabbard to match. Brass dragons duel at the top of the scabbard, and a woven cord attached to a loop allows you to easily hang this decorative medieval replica up on a wall. A unique collectible or gift for any fan of Robin Hood, medieval weaponry, or English legends, the Ornate Brass Robin Hood Tassel Dagger will impress with its intense and elegant detail.